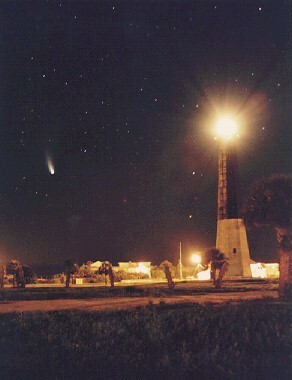 This beautiful photo of the Tybee Island Lighthouse and the comet Hale-Bopp was taken by Topi K. Tuomi on March 18th, 1997. TYBEE.COM thanks Topi for his support of our site in allowing us to showcase one of his many photo's. beautiful Tybee Pavilion below to begin your tour now! Thank you for visiting the best Tybee Island tourism experience on the Internet. We hope that you enjoyed your virtual visit to Tybee Island and that you'll come and visit us here on the island very soon. With the continued support of Tybee Island business' and our private supporters located on, and off Tybee Island we will continue to provide you with the most in depth and up to date information about Tybee Island, GA. Please leave us any comments that you might have in our Guest Book so that we may shape the site into what you, the visitor are looking for when you come to find information about Tybee Island, GA.
We also hope that you join us in welcoming our sponsors for the site and will support them when you come to visit Tybee. TYBEE.COM - "It's where Tybee's At!" , Tybee's Official Online Island Guide - Bringing you to Tybee Island, GA for over 13 years.